I.J. Rosenberg is the president of Score Atlanta. 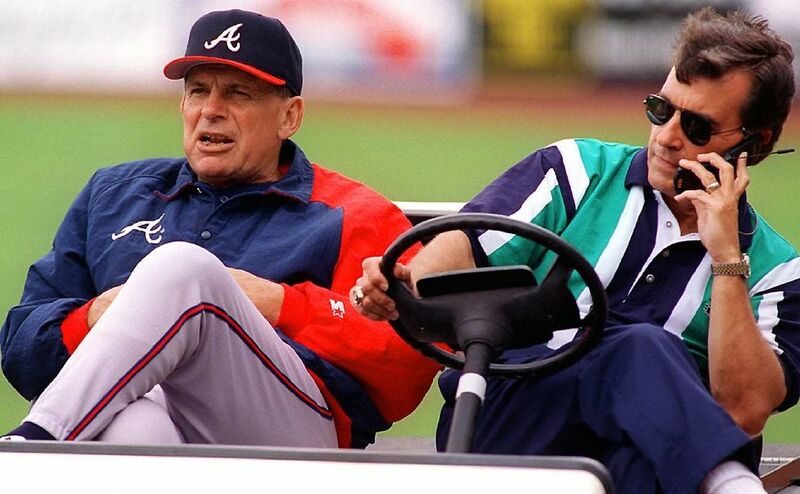 While this is supposed to be a media blog I thought I would start this week’s column with my relationship with then Braves general manager John Schuerholz when I covered the team from 1991-96 for the Atlanta Journal-Constitution. Schuerholz stepped away Thursday as the team’s president and will continue on in a new vice chairman role but for the most part he is retiring from day-to-day duties. At 75 and after more than 50 years in baseball, I know John wants to travel more with his wife Karen and I imagine play a little more golf. When Schuerholz arrived in the winter of 1990, I was just about to be named the paper’s beat writer, replacing Joe Strauss who just recently passed away at the age of 54 due to leukemia. I was 27 and coming off working on an investigative team after two years of being the Georgia Tech beat writer. I remember my first meeting with John in his office at Atlanta Fulton County Stadium and I realized quickly that a lot was going to change for the organization. Because I was coming in new and had not been associated with the bad baseball the club had played for almost all of the 1980’s, my feelings about the team were more optimistic than most of the beat writers around the league. I also realized how difficult it would be for this rookie baseball beat writer as I knew Schuerholz was going to be a very tough nut to crack when it came to getting information to break stories. Actually, for quite some time it was almost impossible to get John to give me anything of consequence. But that was the way Schuerholz worked, close to the vest with a very small inner circle. I remember two specific examples of being very frustrated with him and another where I just made a poor choice of judgment. The first came right after the 1992 season when the Braves had fallen to Toronto in the World Series. It was evident something was missing for the team after two straight Series losses and Schuerholz wanted to put a big bat in the middle of his lineup. He had money to make one big move and it was for Barry Bonds. Schuerholz would go on to write the details about the deal in book “Built to Win’’ but I must have called John 10 times about the rumor and he wouldn’t say anything. I never could get confirmation on the fact that a trade for Bonds had been done but Pirates manager Jim Leyland refused to let Bonds go and that is why the Braves turned and signed Greg Maddux. My editors lit me up for not getting the story. Maddux is the second example of my biggest mistakes while on the beat. Schuerholz always used to tell me be very careful of what agent say. Schuerholz said he may not give me the info but would never lie to me while agents made a habit of it. At the winter meetings in 1992, I knew the Braves were close to signing Maddux but I didn’t know the contract number. The Yankees were battling the Braves for the right-hander and I went up the Braves suite at the Louisville hotel and tried to pin John and Stan Kasten down on the number. Right before I walked in their room, Scott Boras, who represented Maddux, called me and gave me a number the Braves had just offered. I tried to confirm it with John and Stan and both said the number was ridiculous. I went with it anyway and when Maddux signed, my number was $2 million more than the actual contract. Another closed-door meeting with editors. Then there was the one and only time that I really struggled with Schuerholz when I was on the beat and it came when they traded Deion Sanders in 1994. I knew from another source that this was about to happen and begin writing that I was being told Deion was being shopped, causing some problems in the clubhouse, especially with Deion who had no idea he was going to be moved to the Reds. Schuerholz and I didn’t talk for two weeks. Interestingly, I can also thank Schuerholz for helping make me a better beat writer. He was tough but a good role model for a young journalist covering what was the best organization in baseball for many years. I had lunch with Schuerholz a few months back and it was nice hour considering he didn’t have the pressure of being the general manager any more nor did I as the AJC beat writer. It won’t be long before Schuerholz gets into Cooperstown and joins Maddux, Tom Glavine, John Smoltz and Bobby Cox. It would be fitting to put him in the same year (2018) Chipper Jones is eligible to go into the Hall of Fame. And I surely will be there down in front writing about it. I was listening to 680 The Fan Friday and they were calling it “680 The Fin’’ in honor of the fact that for the Final Four, “Front Row’’ host Brian Finneran is joining the “Team Stream broadcasts on TNT and TruTV that will have school-specific slants.’’ Finneran was one of the best football players ever at Villanova. The question is does Finneran know anything about college basketball. We’re going to see as he makes his national debut in front of millions of viewers. … I will say this for Zach Klein at Channel 2: he is one of the few local television sports directors that is constantly trying to break stories. On his Twitter, Klein wrote: “NCAA sources tell me Duke assistant Jeff Capel as emerged as #GaTech #1 candidate to replace Brian Gregory.’’ Klein’s tweet was picked up everywhere. … The AJC did a good job of busting the Schuerholz stepping aside as team president story. They nailed it more than 10 hours before the official announcement. … Next week my blog will feature John Michaels, the new midway host at 929 The Game. I have been listening to Michaels over the last few weeks and he is getting more comfortable with the role and studio partner Rick Kamla. I do wish the station would talk less NBA except when discussing the Hawks.